Get the original Return to Dunwich from Amazon or the revised PDF H. P. Lovecraft's Dunwich from RPGNow. You too can earn money from writing articles by signing up for InfoBarrel. Return to Dunwich by Keith Herber is a role playing game supplement published by Chaosium Inc. for use with their Call of Cthulhu horror role playing game based on the work of H. P. Lovecraft and the second in the Lovecraft Country series set in Lovecraft's version of New England. The supplement is set after the events of The Dunwich Horror and, although a nominal date isn't given, it is presumably based at the time of the other Lovecraft Country supplements, at around the end of 1928. Dunwich itself was only ever referred to by Lovecraft in this story, but the village has been used as a setting by other authors since. The original supplement is not available new in either print or PDF, although print versions of the book can still be found. There is a revised edition, H.P. 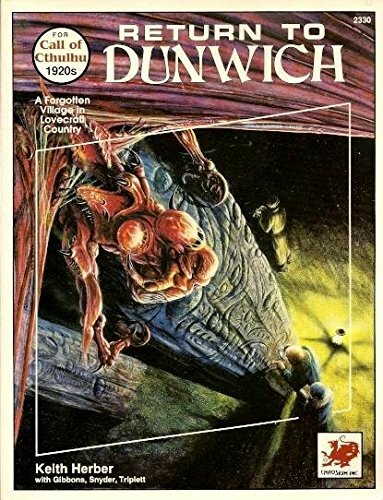 Lovecraft's Dunwich, which is available in PDF from RPGNow, and is designed for use with both Call of Cthulhu and d20 systems. It is a perfect bound softcover with 132 numbered pages, with an additional four pages of front matter and table of contents. The one page Introduction gives a brief overview of the book and there are seven pages of Player Handouts as well as a 17"x22" fold out investigators map of Dunwich County, in which Dunwich Village itself is located. The supplement, as is common in those for Call of Cthulhu, does not really have a traditional chapter structure. There are various black and white illustrations in the book, and the covers are in full colour. Credit: Lee Gibbons/Chaosium Inc./eGDC LtdThe first section, Return to Dunwich, is an adventure scenario intended to be used as a follow-on adventure to the events of The Dunwich Horror, with the players starting in Arkham and then heading out to Dunwich. This section also has a, rather busy, map of New England. Welcome to Dunwich gives an overview of the flora, fauna and climate of Dunwich, together with a chronology for the village, and some details on the difficulties involved in getting around on the country's poor quality roads, where to stay in the village and the telephone service. There is also a two page Village Directory which, despite its name, covers the entire county, not just the village. This directory is a listing of the various non-player characters by name - there is only one business in the entire county - as well as their map location number and a brief description of their interesting point(s). Secrets of Dunwich gives details on, as described, various secrets of the county, including many new spells, a secret history, and why the village is afflicted the way it is. Credit: Lee Gibbons/Chaosium Inc./eGDC LtdThe Village covers Dunwich Village itself and the mill area, with labelled maps of each, describing the locations, NPCs and points of interest. A Guidebook to Dunwich & Environs covers the rest of the county, split into nine regions, each of which has a full page labelled map which also shows how each area is located in relation to the others, covering them in the same way as the previous section. One of the adventure scenarios in Arkham Unveiled is set in the surrounding area. The Underground covers the underground areas of Dunwich and how to get into them, covering various different points of interest, and separated into four different locations, including a Mi-Go complex, a Hyperborean pyramid, and has details on Abhoth, the cause of the village's malaise and decay. Appendix 1: The Dunwich Horror has a chronology of the events for that story and various NPC statistics, should a Keeper wish to run their own version of the story. The final section, Appendix 2: Secrets, Mysteries, Legends and Rumours, gives various bits of knowledge that can be picked up in the county, separated into the village and ten regions. Credit: John T. Snyder/Carol Triplett-Smith/Chaosium Inc./eGDC LtdAs is typical of Call of Cthulhu supplements, this lacks an overall index and the Table of Contents not only isn't as detailed as it could be, it is also inaccurate when it comes to page numbers, making navigation of the book even harder than usual. The illustrations are, in the majority, portraits of various NPCs who can be encountered, along with a handful of larger images that are relevant to the nearby text, and the black and white maps, the latter giving the impression of being hand drawn. This continues with the tendency for Call of Cthulhu supplements to emphasises the text, not pictures. The one scenario in the supplement is at the very beginning, which is a rather peculiar place to have it, as there are references to places and people that are described later in the book. Really, the rest of the book needs reading first, otherwise the scenario won't make as much sense, and it probably would have been better placing it at the end of the supplement as is more common. Credit: Carol Triplett-Smith/Chaosium Inc./eGDC LtdThis is more a description of a wilderness setting, rather than being a citybook, covering a substantial amount of, often hard-to-reach, countryside. Most of the NPC locations are private dwellings, especially farms, with only one, true business in the entire area, even though there are plenty of things that can be purchased. As mentioned earlier, Lovecraft himself only wrote about Dunwich once so, although all his characters have been included, they have been greatly expanded upon with the addition of the people and places. There are also many references to Hyperborea, and therefore the works of Clark Ashton Smith. The supplement has plenty of potential adventure seeds, both in the various locations and in the NPC descriptions. In the latter case, it might have helped to have marked them as such. Although there is a listing in the Village Directory, this lacks page numbers, so to make the best use of them all will require going through the book and making note of them. This supplements greatly expands Lovecraft's vision of the village, although it doesn't seem quite as bad as Lovecraft's own description, it does have the potential to become worse, thanks to the presence of Abhoth. Return to Dunwich is still a worthy expansion of the Lovecraft Country series, despite the flaws.